As we read 1 Kings, we find out that King David is now old and his health is failing. David has already announced that his son, Solomon, will be the next king. 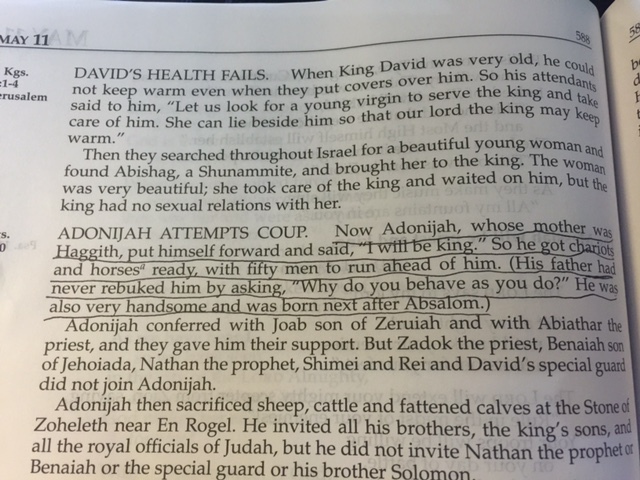 But his other son, Adonijah, has decided that he is going to be king. So he starts rounding up people who will support him in this effort. Against the wishes of his father. Why would he do this? We read that “His father had never rebuked him by asking, ‘Why do you behave as you do?”. David had not disciplined Adonijah. He had not corrected him when Adonijah’s behavior was out of line. The result is behavior like this from David’s own son. No obedience to his father’s wishes. No respect for his father’s decisions. We get an insight into another side of David. He was a great king but it looks like he wasn’t as good of a parent. We have already read about a couple of other exploits of David’s children when they misbehaved. Adonijah doesn’t appear to be the only child that was not disciplined. And David paid the consequences for this lack of discipline as he now deals with his grown child’s bad choices. Parental discipline – and the lack of it – shows. It shows in our young children and it continues to show up in our grown children. Dear Father, please help us be great parents who discipline our children well.